Just a quick slide from a presentation I’m giving tomorrow…kinda speaks for itself, I think. Share the post "Whose Economy You Talkin’ About?!" 10 comments in reply to "Whose Economy You Talkin’ About?!" It’s not just corporations whose profits overwhelmingly flow to the 1% (see also Saez and Piketty) who are doing well. 3 out of 10 households average over $92,000/year (even if their incomes have stagnated) Another 2 out of 10 households average $60,000 to $70,000, many (nearly 1/2) with only 1 wage earner. If you had the ten households making up America in a room, what programs do you think those 5 would favor. Which 5 of the ten would hold the most sway? There’s a reason the Democrats aren’t pushed to offer any progressive policy initiatives. Most of the top 10% really average less than $200,000, the $188,000 average is good for the top 90% to 98%. The top 1% make minimally more than $500,000, averaging $1,500,000, the top incomes are so skewed, especially the .1% and .01%, that including them more than doubles the average for the top 10%, though 80% of the top 10% average only a little less than $200,000, hence the $460,000. You can check the math, $200,000 * 8 for the 90 to 98%, is nearly doubled by the $1,500,000 average for the 1% (the 99th% somewhere between). Data from http://en.wikipedia.org/wiki/Household_income_in_the_United_States, and I saw a similar treatment elsewhere too. Smith- You wrote, “There’s a reason the Democrats aren’t pushed to offer any progressive policy initiatives.” What exactly is the reason? I see your data. But how does that prevent Democrats (rightly or wrongly) from offering any “progressive” (if you can use such a broad word for their agenda) ideas? I think the distribution of income of the ten households that make up America, is representative of Democrats as well as Republicans. I don’t have data on that and would be interested to see some estimates. Obviously it can’t come directly from Census data, but indirectly by zip codes, or from survey, though self reporting income levels is highly suspect. My point is there are huge reasons why someone in the top five households would be hesitant to make important changes to the current economic system. The lowest grouping that five makes an average of nearly $60,000 and half the time does it with only one wage earner. At that point they’re already making 1/3 more than the next household, and minimally twice what the three of the ten are earning. But even if you only consider the top four out of the ten, they are doing well, even if the fourth from the bottom has stagnated. But we are a republic, and one made up of independent states, not a majority rules direct national democracy. Even if we were (and I’m happy we’re not), I have no doubt the richer households would exert more influence. Usually making more money is a byproduct of having more control, being the boss, owning businesses, controlling the media, running things in general. This includes the government. Politically you might only need three, or two, or even one, out of the ten to run things. Keep in mind the one in ten makes as much as the other nine combined, that gives him enormous influence. If you consider “Whose Economy You Talkin’ About? 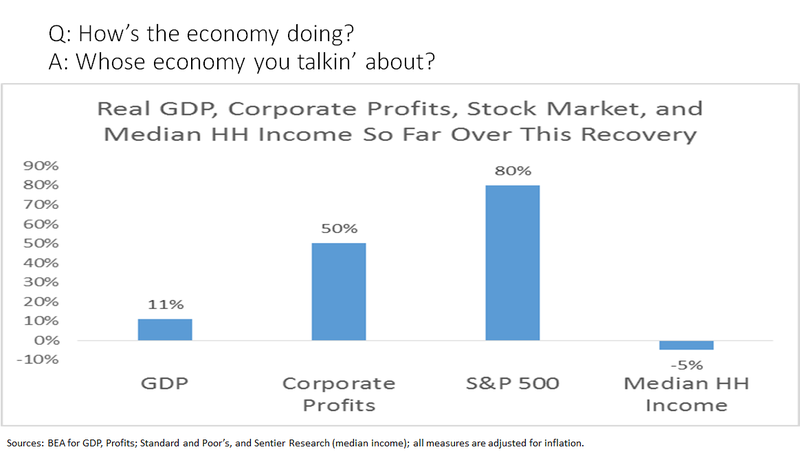 !” corporate profits (which flow to the 1%) are very important. But Obama wants to lower rates for a one-shot extra boost of income. But if you think about how income is distributed, you’ll understand why Democrats are not motivated to return to Eisenhower levels of equality. In my writings, I tell people all the time that if they want a hedge on automation and globalization, they must invest in those companies profiting from automation and globalization. That way if they are displaced by such, they are still earning some net-positive profit from the same. Also a reason to relook at Capital Gains tax policy. And an even better reason to look at patent monopolies and gutting of antitrust legislation. Competitive capitalism never would have generated these outcomes. Median wage is such a deception with such a skewed distribution as we have here that it should never be used without a at least a corresponding statistic showing the % of wage income earned by the 1/2 of the distribution that falls below the median. What information is really conveyed by the use of this measure in isolation? What does it really tell us about how income is really distributed? QE is a failure and your chart is Exhibit A.